The SCRSS organises a regular programme of lectures, film shows, exhibitions, seminars and other events at its premises in London. The Society is also involved in educational and commemorative events associated with the Soviet War Memorial in London. Events are open to both SCRSS members and non-members, unless otherwise stated. Please note: dogs are not permitted on SCRSS premises, with the exception of guide dogs. Most events take place at the SCRSS. Evening events normally start at 19.00, with tea and coffee served from 18.30. Lecture and film tickets cost £3.00 (SCRSS members) and £5.00 (non-members), unless otherwise stated. For all other events, please see individual listings below. Please note: tickets are payable by cash only on the door (unfortunately, we are unable to accept debit or credit cards). The course is led by Christine Barnard, former lecturer in Russian at the University of Westminster. Maximum 10 students. Fees: £40 per term (SCRSS members), £60 per term (non-members). Full fee payable at start of term by cash or cheque only. The commemoration is organised by the Soviet War Memorial Trust (SWMT) and Southwark Council. It begins with a wreath-laying ceremony at the Holocaust Memorial Tree and Soviet War Memorial, which stand together in the Geraldine Mary Harmsworth Park surrounding the Imperial War Museum (IWM) in London. Guests will then proceed inside the IWM for the continuation of the event. Guests attending the indoor element of the event are invited to view the IWM's Holocaust Exhibition after the ceremony concludes. 10.45: Gather at the entrance to Geraldine Mary Harmsworth Park (in front of the IWM main entrance and near the park cafe), Lambeth Road, London SE1 6HZ. 10.55: Process to the Soviet War Memorial / Holocaust Memorial Tree. 11.00: Wreath-laying ceremony begins at the Soviet War Memorial and Southwark Council's Holocaust Memorial Tree. 12.00: Commemoration continues inside the IWM (Roof Terrace on 4th Floor). Please note: Wreaths may be laid at the Soviet War Memorial and / or at the Holocaust Memorial Tree. There is no seating provided outdoors - this part of the event is expected to last no more than 25 minutes. Due to limited seating, if you wish to attend the second part of the commemoration inside the IWM, please contact the Mayor of Southwark's office directly on Tel: 020 7525 7303 or Email: mayors.office@southwark.gov.uk. If you intend to lay a wreath on behalf of an organisation, or you will be carrying a standard, please reply directly to the Honorary Secretary, SWMT on sovietwarmemorialtrust@gmail.com by noon on Wednesday 23 January. The Soviet War Memorial was unveiled in 1999 on the initiative of the SCRSS and the Society has been supporting the work of the SWMT since its foundation. The SWMT organises three main ceremonies at the Memorial each year to mark Holocaust Memorial Day (January); Victory Day (9 May) and Remembrance Sunday (November). The Loan Library (Literature and History collections) and General Reference Library (Reading Room) will be open for use by members without prior appointment. De-acquired books and a selection of donated Soviet / Russian souvenirs will be on sale. You can deal with your membership renewal or even join the SCRSS on the spot to take advantage of access to the SCRSS Loan Library. In addition, our selection of mugs priced at £6.50 each, and featuring striking designs from the SCRSS collections will be on sale (cash / cheques only). SCRSS members only. Alexandra Smirnova of the Science Museum discusses their current exhibition which runs until 24 March 2019. Set against a turbulent backdrop of social upheaval and war between 1900 and 1918, the exhibition explores the huge influence of medicine on the family of the last Tsar of Russia during this period, from the young Tsarevich Alexei's haemophilia B - a rare blood condition passed down from Queen Victoria - to the Tsarina’s mental health, and the influence of doctors and spiritual advisers, including the infamous mystic Rasputin. The exhibition includes unique artefacts, documents and photographs never before on public display in the UK, examines the crime scene and discusses the advances in medical and forensic science that later transformed the investigation into their deaths. 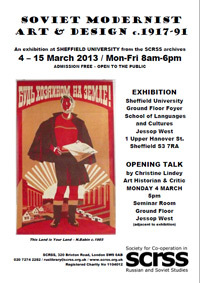 The talk is open to both SCRSS members and non-members. Normal entrance fees apply: SCRSS members £3.00 / non-members £5.00. Pay cash on entry. Andrew Jameson follows on from the first part of his talk delivered in October 2018, looking at what the Russian language can tell us about Russian history and the Russian character. Andrew Jameson taught Russian language and culture at Portsmouth and Lancaster universities, and organised many popular residential courses for adults at Knuston Hall, Alston Hall, Essex, UEA and Lancaster. His particular interests are the Russian avant-garde in its various manifestations and the cultural history of the Russian language. Since retirement he has often lectured in St Petersburg, Moscow and Khabarovsk. He now works as a professional translator. Christine Lindey, art historian and SCRSS Exhibitions Officer discusses her new book, published in September 2018 by Artery Publications (see the Artery website for further information). The book focuses on British artists, but many of these were influenced by the Bolshevik Revolution, some such as Rowe and Binder worked in the USSR as artists in the 1930s, while Soviet Socialist Realist theory and practice were the subject of much debate among socially committed artists and critics during the Second World War. "Christine Lindey is a doyenne of British art history and one of its most original, accessible and principled practitioners... Her thought and writing combine academic rigour with a rare lucidity. In Art for All she explores a rich vein of British art that in the 1940s and 1950s kept alive the idea of a socially committed and widely understandable art in the face of the increasing dominance of elitist forms of modernism and abstraction that had become tools of the West on the cultural front of the Cold War. As a historian of British art myself I found this book a revelation. An important contribution to the history of British art, this book, in its focus on a socially and politically aware practice that seeks a genuinely wide audience, seems particularly timely in this historical moment of rampant individualism and raging inequality." Simon Casimir Wilson OBE. Act of Remembrance at the Soviet War Memorial to mark the 74th anniversary of the Allied Victory over Fascism. The memorial is situated in Geraldine Mary Harmsworth Park, adjacent to the Imperial War Museum, Lambeth Road, Southwark, London SE1 6HZ. By 10.15: Standard bearers to arrive and report to the Parade Marshal. By 10.30: Wreath-layers to arrive and report to the Honorary Secretary of the Soviet War Memorial Trust (SWMT). By 10.45: All other participants to be present. 11.00 Ceremony starts (lasting approximately one hour). Please note: There will be very limited seating available and this is intended for veterans and older participants (and those accompanying them). Jane Rosen (former SCRSS Librarian) and Kimberley Reynolds discuss their new book, co-edited with Michael Rosen, and published by Oxford University Press in September 2018. It reveals the little-known genre of politically committed children's literature in inter-war and post-war Britain, and includes more than fifty examples and extracts from picture books, plays, song-books, novels and pamphlets. Between 1900 - 1960 large sections of the British population embraced a spectrum of left-wing positions with a view to maintaining peace and creating a more just, less class riven, more planned and enjoyable society for all. Children's books and periodicals were a central part of radical activity as the young were expected not just to inherit but also to help make this new society. Reading was regarded as the most direct way of helping them acquire the skills for the task. Grouped into fourteen thematic sections, the anthology contains a wide selection of the kinds of materials that left-wing and progressive parents would have wanted their children to read, and covers the full age spectrum of young readers, from pre-school children to adolescents. Among others, these extracts include translations of such Soviet classics as Wash 'Em Clean (1923) by Kornei Chukovsky, What is Good and What is Bad (1925) by Vladimir Mayakovsky, A White Sail Gleams (1936) by Valentin Katayev, Timur and His Comrades (1943) by A Gaidar, and more. See the OUP website for more information. There will also be an opportunity to view the recently re-located SCRSS Children's Literature collection, which Jane Rosen has sorted and re-shelved. The Loan Library (Literature and History collections) and General Reference Library (Reading Room) will be open for use by members without prior appointment. De-acquired books and a selection of donated Soviet / Russian souvenirs will be on sale. You can deal with your membership renewal or even join the SCRSS on the spot to take advantage of access to the SCRSS Loan Library. In addition, our selection of mugs priced at £6.50 each, and featuring striking designs from the SCRSS collections will be on sale (cash / cheques only). What is it that attracts so many of us in the West to this part of the world? Caroline Walton talks about her new book, which describes her personal experiences, the people she has met and the Ukrainian-Russian family she married into. She has discovered in them a spiritual strength that has enabled survival of famine, war and nuclear disaster. The talk will include discussion. Caroline Walton is the author of several books on Russia and the former USSR, including The Besieged (about the siege of Leningrad). A Russian to English literary translator and editor, she helps Russian-language authors achieve publication in English (see Sirinbooks.com). Her new book My Cossack Family - And Other Remarkable People in Russia and Ukraine is due for publication in May 2019. Open House for Lambeth Heritage Festival details TBC. Together with professional Russianist Michael Pushkin, Simon Nicholls has translated the writings of the Russian composer Alexander Skryabin (1872-1915). Skryabin’s private journals, presented with relevant letters and other material from the composer and his contemporaries, go far towards explaining the origins of his idiosyncratic world-view. Simon Nicholls has researched original material and comments by Skryabin's associates and contemporaries, and provided commentaries and annotations that dispel popular misconceptions and reveal the constellation of philosophies that shaped the composer's ideas. The book has been hailed by Marc-Andre Hamelin as "an immensely valuable addition to our understanding of every aspect of this most enigmatic of Russian composers", and has a foreword by Vladimir Ashkenazy. Illustrated with photographs from the Skryabin Museum, The Notebooks of Alexander Skryabin (2018) is published by Oxford University Press. In his talk to the SCRSS about The Notebooks, Simon Nicholls will include consideration of Skryabin's attitude to socialism and a short account of how this mystical idealist was posthumously adopted into the Soviet canon. Simon Nicholls is a pianist, teacher and independent researcher. His career has included performing and broadcasting on four continents, and teaching at the Yehudi Menuhin School, the Royal College of Music (London) and Royal Birmingham Conservatoire, of which he is an Honorary Fellow. He has now retired from institutional teaching. From 2001 to 2017 he made many research trips to Moscow, collecting materials and discussing Skryabin with Russian musicians and academics. Robert Chandler will discuss his two most recent translations - of Vasily Grossman's novel Stalingrad and Lev Ozerov’s poetry collection Portraits Without Frames. Grossman's Life and Fate has been hailed as a 20th-century War and Peace. However, Grossman did not originally conceive of Life and Fate as a self-contained novel. It is, rather, the second of two closely related novels about the Battle of Stalingrad. The first of these two novels was first published in 1952 under the original title Stalingrad. The characters in both novels are largely the same and so is the storyline; Life and Fate picks up where Stalingrad ends, in late September 1942. One of the most memorable chapters of Life and Fate is the last letter written from a Jewish ghetto by Viktor Shtrum’s mother. The words of this letter do not appear in Stalingrad, yet the letter makes itself powerfully felt throughout the novel. In 1946 Ozerov published a long poem about the massacre of Kiev Jews at Babi Yar, one of the first works to address the subject in Russian. He was also one of the contributors to The Black Book, a documentary account, co-edited by Grossman, of the Shoah on Soviet and Polish soil. Ozerov's posthumously published Portraits without Frames includes moving portraits of the four Soviet Yiddish poets executed on Stalin's orders in August 1952. Robert Chandler's translations from Russian include many works by Vasily Grossman and Andrey Platonov. He has also compiled three anthologies for Penguin Classics: of Russian short stories, of Russian magic tales and (together with Boris Dralyuk and Irina Mashinski) of Russian poetry. He is a co-translator of three volumes of memoirs and stories by Teffi and the author of a short biography of Alexander Pushkin. His translations have won prizes in both the UK and the USA. Teaching is increasingly important to him, and he runs a monthly translation workshop at Pushkin House (London). Robert is also a Vice President of the SCRSS.